Like most things in life, this all started with someone’s message on Twitter. A close look at NuGet package signing feature, where it's useful, and in which ways it falls short. There’s no harm to anyone if you do sign your package. You’re right Phil, and how can you argue with that forehead…so let’s do this. 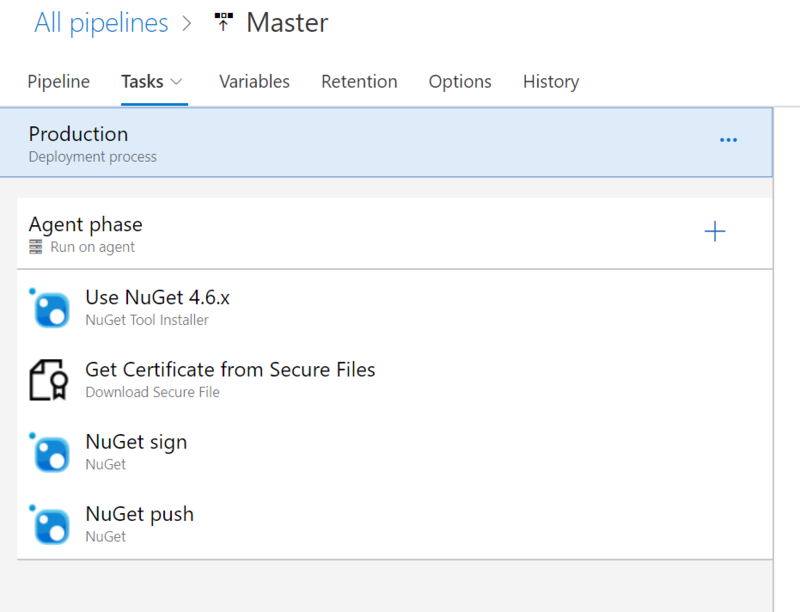 What is NuGet? NuGet is a package management system that was primarily developed for .NET developers and has now become a de-facto package/release mechanism for that ecosystem. What npm is to Node.js developers, NuGet is to .NET developers. More info at https://www.nuget.org. I’ve got a little library for helping .NET developers be more productive with creating Alexa apps, Alexa.NET. When I started this project I used to just have this on my local box and would build things using Visual Studio and manually upload the NuGet package. Then people made fun of me. And I ate my sorrows in boxes of Moon Pies. Luckily I work with a bunch of talented folks and helped me see the light in DevOps and helped me establish a CI/CD pipeline using Azure DevOps. Since then I’ve got my library building, a release approval flow, automated packaging/publishing to the NuGet servers. I simply just check-in code and a new version is released. Perfect. Now I just want to add code-signing to the package. Naturally I do what every professional developer does and Google’d went to read the docs about code signing NuGet packages. Luckily there is some pretty good documentation on Signing NuGet Packages! The first thing you need is a code-signing certificate. There are many providers of these and different prices so pick your preferred provider. I chose to use DigiCert for this one but have used other providers in the past. The process for getting a code-signing cert is a bit more than just an average SSL certificate so be sure to follow the steps carefully. Once you have that in place, export the DER and PFX versions as you will need both of these for this process. Your provider should provide instructions on how to do this for you. The next thing I need to do is also provide my password for that exported PFX file (you did export it with a password right!). To do this I made use of variable groups in Azure DevOps, created a group called CertificateValues and added my name/value pair there, marking the value as a secret. As a variable group I can ‘link’ this group to any build/release definition without explicitly having the variable in those definitions. This is super handy to share across definitions. 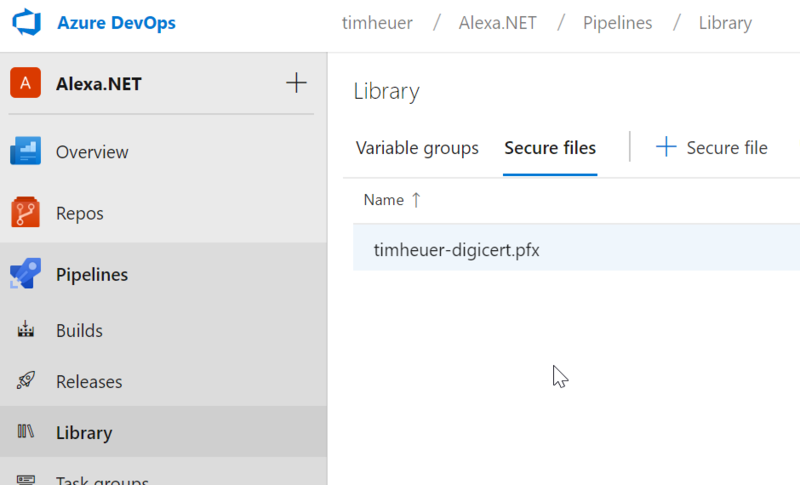 You can now link to an Azure KeyVault for secrets (more to come on that in a part 2 blog post here). I’ve got my code signing cert (PFX) and my certificate password stored securely. With these two things now I’m ready to continue on my definition. To explain a bit I’m using some pre-defined variables System.ArtifactsDirectory and Release.PrimaryArtifactSourceAlias to help build the path to where the drop folder is on the agent machine. The others are from the secure files (Certificate.secureFilePath) and variable group (CertificatePassword) previously defined. These translate to real values in the build (the secret is masked in the logs as shown below) and complete the task. This was a good exercise in helping me learn a few extra steps in Azure DevOps working with files and custom task variables. Immediately as I was doing this, my friend Oren Novotny couldn’t help but chastise me for this approach. 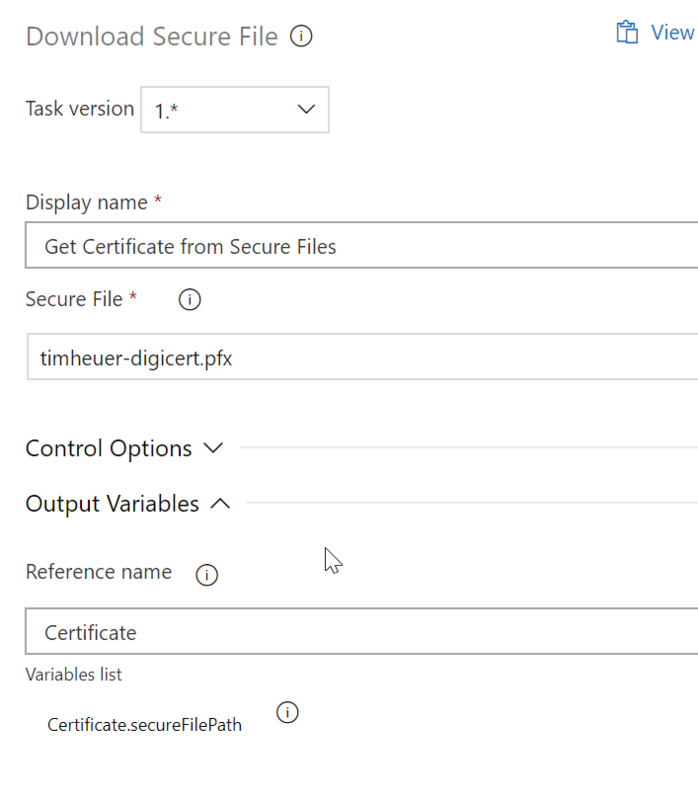 So stay tuned for a secondary approach using Azure KeyVault completely to complete this without having to upload a certificate file.